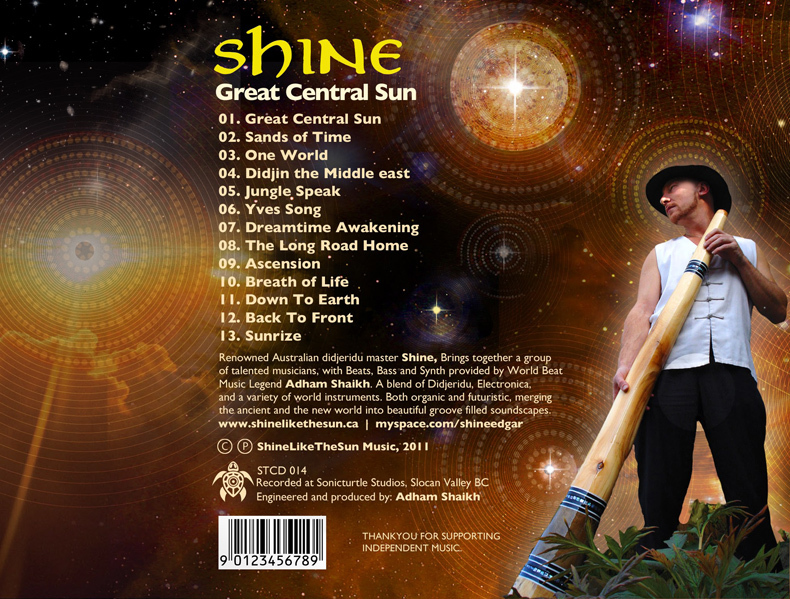 Renowned Australian Didjeridu master and World fusion artist Shine, joins forces with World Beat music legend Adham Shaikh, to create a vista of beautifully groove filled soundscapes. 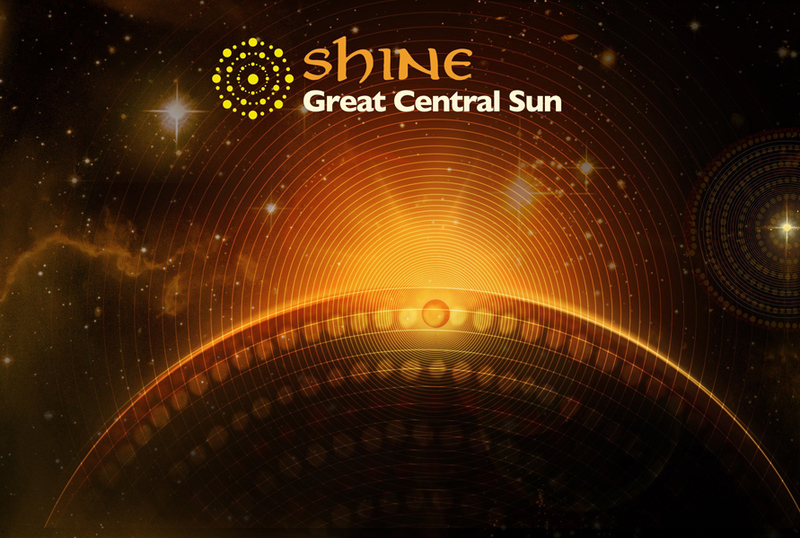 Blending Didjeridu, Electronica and a wide variety of world instruments ( over 20 ) from Africa, India, Europe and the Middle East. 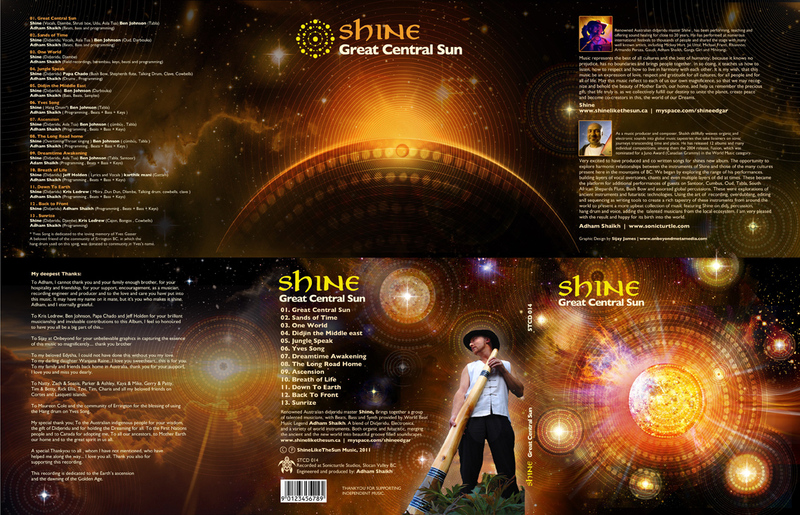 and featuring the talents of Ben Johnson, Kris Ledrew, Papa Chado and Jeff Holden. 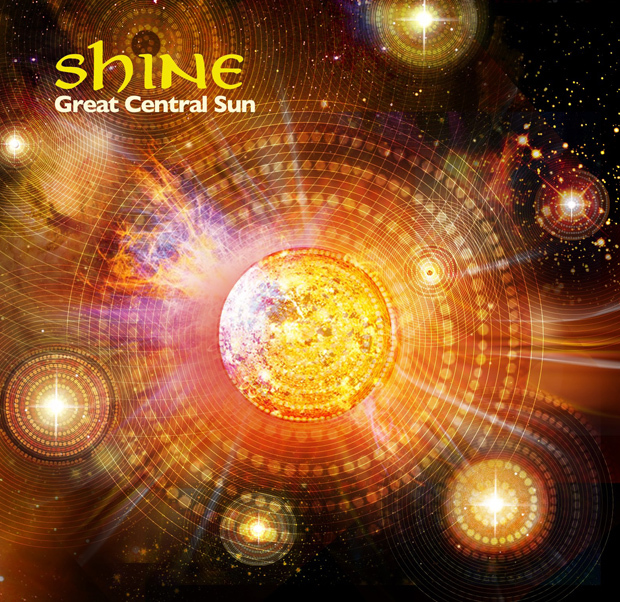 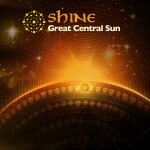 Great Central Sun, merges the ancient and the new, paying homage to both ancestral and cosmic origins, embracing the past and and venturing bodily into the mystery of new and wonderous musical horizons. 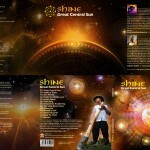 ” Great Central Sun ” is being released on Adham Shaikh’s esteemed Sonic Turtle record label, humbly joining the ranks of numerous world beat album classics, including the 2004 Juno award nominated ” Fusion “, as well as ” Collectivity “, ” Dreamtree Project ” and more recently ” Universal Frequencies “. 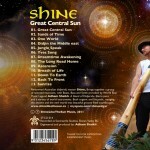 Shine, has been performing, teaching and offering sound healing for close to 20 years, He has performed at numerous international festivals to thousands of people and shared the stage with many well known artists, including Mickey hart, Jai Uttal, Michael Franti, Rhiannon, Armando Peraza, Gaudi, Adham Shaikh, Ganga Giri, the Gyoto Tibetan Monks and Yunchen Lhamo & Mihirangi.